Sociable Weaver, Range-change map between SABAP1 (1987-1991) and SABAP2 (2007-current). 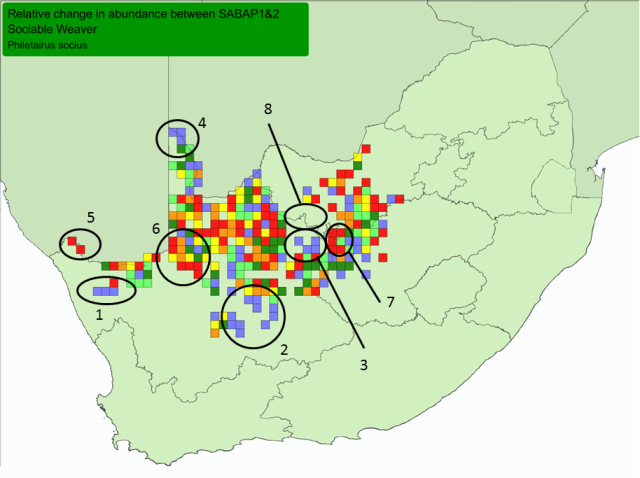 In South Africa the Sociable Weaver has more grid cells with decreases in reporting rate than cells showing increases, between SABAP1 (1987-1991) and SABAP2 (2007-). The points below match the points on the map above. 4. and the northernmost part of the Kgalagadi Transfrontier Park. 7. and the area south of Christiana. There is a large gap in range of the Sociable Weaver around the Ghaap plateau, between Danielskuil and Vryburg. The weaver appears to have been absent from here for at least 100 years. There are new records (SABAP2) in the southern part of this gap (point 3), indicating that the Sociable Weaver may be colonising this area northwards. Botswana: range extension near Konkwe Pan (Tyler 2008c).